It has finally stopped snowing. From Monday night to today, Idaho Springs, CO received 80" of snow. Yes 80. I guess that I don't have to be in such a hurry to finish my project. Here is a pic of my two 914s that don't enjoy garage space. You SoCal guys go take your cars for a drive for me. There aren't too many trucks out there that can handle 80" of snow.. Was you whole town shut down or what??? Here in Virginia if we get 3" or more the whole place freeks out. People buying water like it's the end of the world. It's a riot to see. Wow. 80 inches. The ski resorts around here would positively kill to have 80 inches of snow on the ground in total!!! We have a jeep, and after the front end loader Cat with the 8' tires came through, I was able to get that out, after 2 hrs of the old scoop and throw gig. We normally don't get much snow at all, this was just one of those 'perfect storm' type things. They are both parts cars, my no rust car is sleeping in the garage with the furnace on. I am in colorado springs and we only have about 2feet in our yard and no hope of the snow plow coming until spring time. my teener is not so fortunate to be inside as the pony car is in the garage and my baby is under the car cover.she only has about 10 inches on her as i cleaned her off yesterday. yes the perfect strom it was. and it's still snowing here!!!!! Ahhhhhhhhhh, That's why I live in San Diego!!!! I was stationed in upstate NY when in the Navy and I had to keep my Harley outside in the winter. I used several large sheets of fiberglass to make a U shaped cover so once the snow go up high I would just tunnel out to it!!!! Don't worry spring will be here soon! Am I the only one who saw those two beautiful creamy white lumps and thought about how at birth we all gravitate toward the breast of the mother............and in adulthood, we (the participants of this forum) also see those wonderous orbs and feel a sense of longing??? "Seriously Honey, the part was really really cheap...........honestly"
Wow you really got hit! Hows your project comin along? It is going well, it was supposed to go to paint this week. The motor is done, but in Denver on the other side of the closed road. It is on all four wheels for the first time in 3 yrs. Everything worked out great. I just don't want to get too far so that when I have it painted, I can have all the stuff I want done (engine compartmetn and under the hoods and all that. Oh well. Q: How many fingers am I holding up?? I guess a warm shower at midnight is out of the question????? It's been raining here ever since I got my new car, I should have bought a U-boat. Nice pic johnboy914. We only got 30" down here. 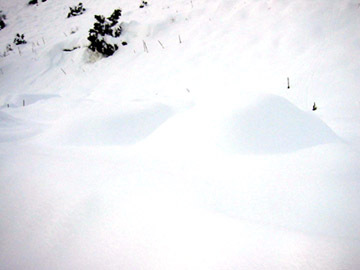 Some monster drifts though. Shoot me an email offline. We've got a local email list. Lotsa good guys. One of our last fall runs had us lunchin in I.S. It's opening my garage door that has me scared. Can you say avalanche? Good! I though you could!